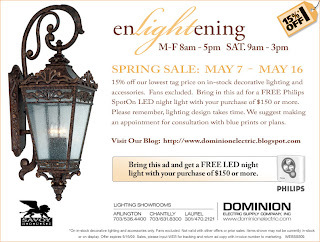 Greg Tiedemann in our marketing department just sent me this preview copy of our upcoming Spring Sale. This will go out next week to our mailing & emailing list, but you can also print it out from this blog, bring it in, and get the special discount. And if you spend $150 or more, we have a FREE Philips SpotOn LED night light to give you! If you'd like to get onto either mailing list, please let Greg know at gtiede@dominionelectric.com ~ he'd love to add you. It's the picture on the left, but the sizing information is on the right. 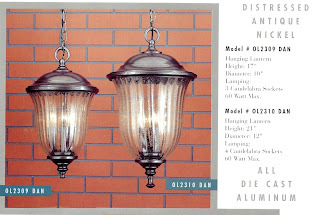 It's from their Lanesborough Collection and is a distressed antique nickel finish on die-cast aluminum. The size is 10" wide by 17" high, and it takes three 60-watt candelabra lamps. The original price was $216.90, now reduced down to $119. The glass is hand-blown fluted and seeded, which nicely reduces glare from the light bulbs. It would be beautiful in an entry or stairway, either indoors OR outdoors!